I removed the sleeves, hemmed the arm holes, and took in the body. I'm SO glad I did because it's a dress I love to wear now!! Dress: vintage; Tights: c/o We Love Colors; Shoes: c/o B.a.i.t. Footwear; Belt: Target (stolen from Hope); Headband: trim left over from this project; Ring: Oh My Deer! I LOVE it! It looks so cute now! Super cute! Makes me feel inspired to learn how to hem up clothing better so I can do this sort of thing too. Great job! I love it! It's a completely different dress. And those shoes! I die!! REALLY love this dress!!! And those shooooes. Goodness gracious, lady. LOVE them. it looks gorgeous on you!!! i love your style. very cute. I love what you did with the dress, it looks so cute, I simply adore anything with eyelet. Those shoes are super adorable as well. You are too pretty. SO cute! You must be really good with a sewing machine! I am not at all. The dress looks fabulous! Such a cute rework! You seriously come up with some super cute dresses! I love it and of course you look like such a doll! Ohhh I do love your shoes... they look like "happy" shoes! My "happy2 shoes are gold & glittery & wearing them makes me smile! I LOVE it!!! Your entire outfit is adorable!! You are so talented! This dress is adorable! I love it! You did a great job on the altering...wish I could do that! :P Those shoes are so cute,too! Great job! This is so cute and perfect for summer! I love re working an outfit and finding you love it all over again. Plus it has sentimental value. I wouldn't part with it either. everything about this outfit is perfect! i especially love these shoes!! ah! it is so cute! gack! i love what you've done to this dress. too cute! What fun shoes and how nice to get a new-old dress! I love the combination of those tights with your shoes! So whimsical! Love the outfit! It's so cute. Is that a new tattoo of a feather I see? you win. you're the cutest girl ever :) nice work on the dress. Katie, thanks for posting this. I love when you do these. You have such a good eye and are so skilled! this really makes me wish I could sew because that dress looks really really awesome now! Wow you are like wonder woman of the dresses, Another amazing job. Great idea for the summer!!! you did a fantastic job with the dress, and the shoes are to die for! 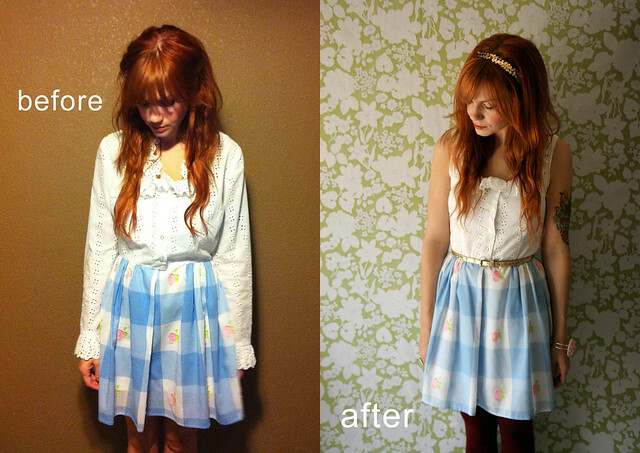 Love the way you restyled the dress! I can't believe what a difference sleeves/no sleeves makes. It looks lovely! Great job!! So cute! Your blog is so inspiring! Thanks!! those shoes are ridiculously cute! How beautiful! I guess it pays to be crafty (which I am not)! You're so talented! Please come with me the next time I visit my mom so we can hem and sew all of her old vintage dresses so they'll fit me! I love it! I've been modifying vintage dresses for a couple of years now and, really, one of the best and easiest things you can do to completely transform a dress (after taking the hem up, of course) is to remove the sleeves. Lovely dress! I think every single dress looks good on you. You look absolutely adorable in all of them! Love the way you changed the dress. It's so much better and I'm in love with that top. You are so talented, Katie. Absolutely incredible. You did a great job! I liked the old version, but I think the new one is so much better.